Full disclosure: I avoided making homemade salad dressing for years. I mean, I was already making homemade bread, crackers, pasta, pickles, pasta sauce and lots of other goodies but we were still buying salad dressing. It always kind of seemed like a complicated affair. Have you read the ingredients on those bottles? Even italian has a pretty intimidating list. I was sure I couldn’t replicate it. And you know what? I was right (there is no replacement in my kitchen for the flavor of preservatives) but it’s okay because as soon as I tasted this recipe I swore off the store stuff. It’s tangy, garlicky, clean and oh so quick and easy. Plus it totally reduces food waste. What have I been doing all these years pouring my excess pickle juice down the drain? Place all your ingredients in a mason jar and shake them up. That’s it! Super easy right? You can play with the seasonings quite a bit depending on your preferences and pickle juice. 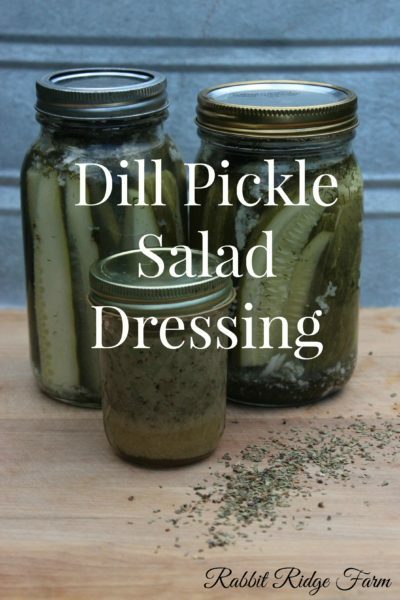 We’ve used pickle juice from hot dills that had a jalapeno soaked in it and it was to die for. Which is crazy coming from the girl whose nose runs when she eats medium salsa. So get crazy throw some cayenne or something in there. It’s pretty hard to mess this dressing up. It stores well in the fridge just shake it before using. I haven’t tried it but you could probably blend it with and immersion blender for a thicker dressing that separates less. Now as much as I’d like to enjoy a big salad with this stuff I have to get back to the kitchen. This dressing was just a small step in beating back the cucumbers that are literally taking over my kitchen. This post has been linked to Home & Garden Thursday , Share Your Cup, and Our Simple Homestead Blog Hop. 2 Responses to "Dill Pickle Salad Dressing (Sugar-free & Vegan!)"